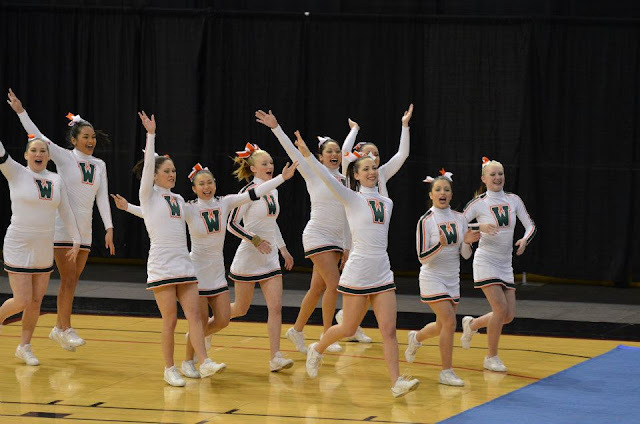 Back-handsprings Through Bridgetown: Cheerleading State Champions 2012. Okay, our girls have had this routine for six months. They were hitting their stunts all week. Things were cleaned up and motions were sharp. I knew they would have their best performance yet. It was time for them to hit their State Championship routine. As coaches, there is nothing longer than the 2 minutes and 30 seconds that decides whether or not the kids you have encouraged, pumped up, coached and invested in are going to come out of this day feeling defeated or triumphant. Five coaches, who do not want the responsibility of managing disappointment, and a squad of teenage girls, with insurmountable nerves, prepare and anticipate the outcome of a measly two and a half minutes. As the music swells so does the anxiety. Our girls attack the mat with energy and determination. I am suddenly filled with pride because I get to be on the coaching staff of this remarkable team. They will never forget that moment for the rest of their lives. Tears, excitement, hugs. Everyone was over the moon. They had worked so incredibly hard for that outcome and they deserved it! Wilson was going to take home the first place trophy. This is the moment our girls knew they had won! Priceless faces. I know I have been the worst blogger ever, but I am back! Congrats to you and your team! I love the ponytail spin in the middle of the routine - awesome touch. Really though, the girls looked great. Their movements were really sharp compared to some of the other teams and the routine utilized a lot more of the floor than others. So fun to watch! um ok I kind of got teary eyed watching their performance!! They are so good! Way better than my squad in high school. Congratulations!!! Oh my goodness, those girls have got some moves! And that whole performance was incredible. Congrats to you and them!